Bird Watching at the Golf Course. No Binoculars Required. The word “turkey” is associated with golf in several ways — in golfing lingo, a “turkey gobble” is the sound a ball makes when it drops in the cup. And three consecutive birdies is sometimes called a “turkey”. 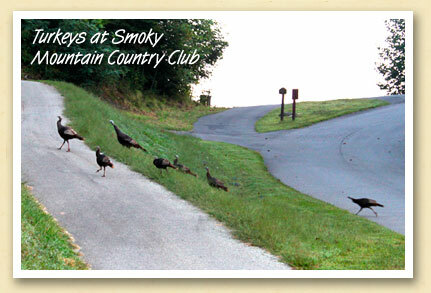 But at the Smoky Mountain Country Club in Whittier, a turkey is just as likely to be a family of wild turkeys leisurely crossing the cart path ahead of you. Sightings of the large birds are fairly common according to owner Mike Cornblum who photographed this group last week. While they’re easy to watch without the aid of field glasses, wild turkeys are easily spooked and will fly away if you get too close. 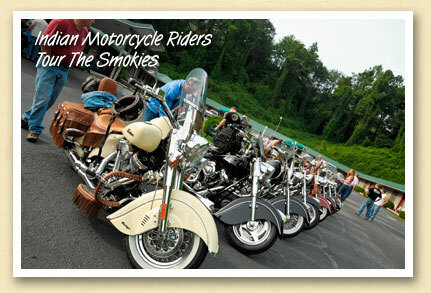 Motorcycle touring is popular in the North Carolina Smokies. Our curvy and scenic mountain roads are nothing short of ‘biker heaven’. Yet one group of riders drew a lot of attention when the “Blue Ridge Iron Indian Riders” thundered into the Gear Head Inn near Cherokee recently. The Whittier motel caters to motorcycle and classic car enthusiasts. The riders were not indian, but the bikes were. They all were Indian Chief motorcycles, with their signature deeply valenced fenders. Considered ‘America’s First Motorcycle’, Indian Motorcycles were popular from 1901 until World War II, when production shifted to supplying military and police vehicles. After the war, the company struggled to recapture its market and eventually closed its doors in 1953. The company was resurrected in 1999 and today Indian Motorcycles are manufactured in Kings Mountain, North Carolina. An exhibit of more than a hundred works of art by 31 Western North Carolina artists and artisans is currently on display through September 27 at the Swain County Center for the Arts in Bryson City. 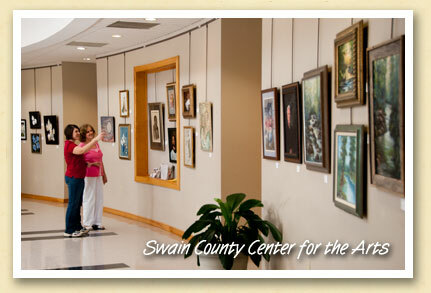 The Center is located in the Swain County High School complex and is free and open to the public during regular school hours – by appointment only – and during scheduled public events at the Center. To visit, call Jenny Johnson, Director, at 828-488-7846 …and bring your checkbook. Most of the works are priced to sell. The next show, scheduled for October thru November, will showcase the pastel, acrylic and mixed media paintings of Bryson City artist Peggy Duncan. How About That? A Parade With Floats That Actually Float! 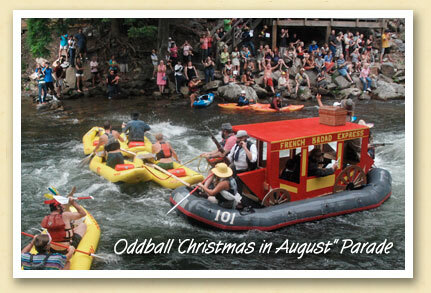 The Nantahala River’s summer-long parade of inflatable rafts, kayaks and duckies was recently interrupted for an entirely different kind of parade — the Nantahala Outdoor Center’s annual “Christmas in August” parade of outrageous, oddball rafts. Thanks to Lloyd Brown, of Miami, for this week’s Postcard photo.